There are few better ways to spend an evening than enjoying the very best classic films at an outdoor cinema. Of course, the days when you and your sweetheart would take in a film from the backseat of your car are long gone! Outdoor movie theatres are the perfect activity for people of all ages, families, tourists, or just dedicated cinephiles. But since the days of the drive-in are in the past? Now, you’ll need to find out how you can seat guests comfortably for them to take in a show at your outdoor cinema. So, what’s the perfect solution? We love the idea of bean bag seats. What makes movie theatre bean bags the right choice for your outdoor movie theatre? Especially if you’re interested in screening longer films — or if you’re catering to senior citizens — you want your audience to be comfortable. While standard outdoor chairs might be cheap? They’re hardly comfortable. In some cases, uncomfortable seating can even be a deterrent, as people today often have the option to watch top films from the comfort of their own homes. The requirement for comfort makes finding comfortable theatre bean bags the priority. Bean bags conform perfectly to the body of the person sitting in them, and they’re much more comfortable to adjust than a traditional chair. You can even find options that offer full body support, especially for the upper body. Plus, because they’re so easy to sink into, you won’t need to worry about staggering them so that no one has their view blocked. When you’re planning your perfect outdoor event, you know that setting up the site and then finishing the cleanup can be especially tough. Sometimes, the process is so stressful, that it’s enough to make you want to cancel your outdoor movie night altogether. But doing that would result in lots of disappointed movie fans. Why not invest in theatre bean bag seats that require a simple drop on the ground? Families and friends can arrange the setup themselves. Plus, they’re very lightweight, so you won’t need to worry about hiring an extra hand to help you store them at the end of the night. Always make sure that you remind your moviegoers to pick up their rubbish after the film before you play the movie. That’s just one more way that you can cut down on the time you spend shutting down your outdoor theatre after the show is over. Nearly two out of every three Australians are currently overweight or obese. With weight on the rise in Australia, businesses need to start giving serious consideration to how they can accommodate all customers. You don’t want to miss out on business because your seating options are too uncomfortable or too small for people of more considerable stature. The same goes if you have moviegoers with special medical needs or other issues. Bean bag chairs are comfortable for people of any size and ability. We understand that you’re likely a bit wary of the overall durability of bean bag chairs — especially when it comes to using them for your outdoor cinema. Our theatre bean bag chairs are specially crafted to withstand the outdoors. Bean Bags made of durable but comfortable solution dyed acrylic fabric, and they even come complete with a five-year warranty. Of course, there will certainly come a time when you need to clean your bean bag chairs. When that happens, all you need to do is take off the washable cover. When you’re considering setting up an outdoor bean bag movie theatre, you’ll likely be surprised by just how many different types of bean bags are available to you. There are bean bags that look a bit like lounge chairs, that even come complete with a matching ottoman. You can get bean bags that offer excellent back support while still allowing your customers’ feet to balance comfortably on the ground. 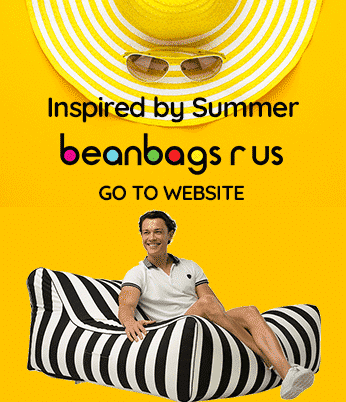 We also offer flat and fabulous beanbags that look exactly like an enormous pillow. These will allow your movie lovers to lean back and take a look at the stars after the film has finished. There are even bean bags that look just like a daybed; just in case, someone wants to take a quick nap during the slower parts of the film. The bean bags are also available in a wide variety of colours. So, you can choose to stick with a singular colour theme, or you can mix and match to add a little extra excitement. Ready to Invest in Bean Bag Seats for Your Outdoor Cinema? 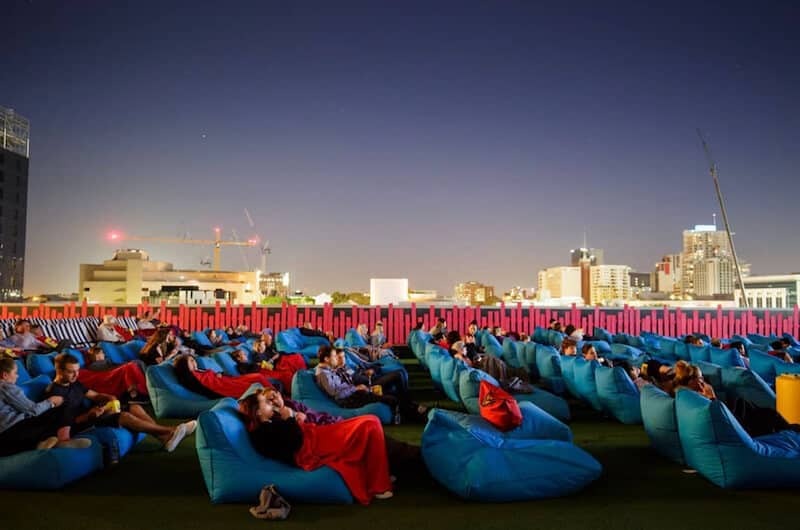 We hope that this post has convinced you that there is no time like the present to invest in bean bag seats for your outdoor cinema. Not only are they incredibly comfortable and accommodating, but they can also be found in a wide variety of materials, and even decorated in your brand’s colours or screen printed with your logo. Are you ready to invest in movie theatre bean bags? If so, then we invite you to spend some time on our website to learn more about the wide variety of bean bag seating options that we have to offer. We can’t wait to help make your outdoor cinema one of the most popular places in town.